Attention bees, birds and butterflies: Please stop by. 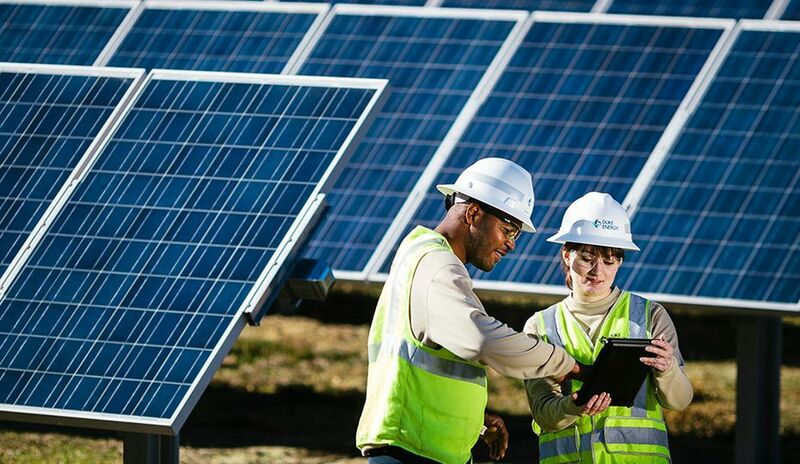 Duke Energy, Bayer and Integrated Vegetation Management Partners (IVM) are creating new homes for you, where you can settle in and grab all the pollen and nectar you want. Keeping pollinators busy and healthy is important for the ecosystem. So important, that June 20 marks the start of National Pollinator Week, a time aimed at increasing awareness of the hardworking insects whose paths from plant to plant help supply the world with food. Colony Collapse Disorder has been blamed for the loss of bees for the last 10 years. The number of bees in the U.S. has declined more than 30 percent in the last five years, a University of Maryland study found. And beekeepers in Europe in 2015 reported a 17 percent decline in colonies. Creating pollinator-friendly habitats has become a natural outgrowth of newer, improved methods of clearing power-line rights of way. In the past, workers would mow an entire area to remove potential obstructions. What often happened was the unwanted vines and woody brush would return with multiple stems sprouting, creating thicker brush, said Jeff Racey, a Duke Energy forester. Now workers target nuisance vegetation carefully with herbicides. When the unwanted vegetation shrivels and dies, low-growing native flowers, grass and shrubs emerge, and pollinating insects and animals follow. Wood-boring bees set up homes in decaying tree limbs and stems. It’s an effective way to keep power lines clear with the bonus of increasing plant diversity and improving habitats for native species, Racey said. 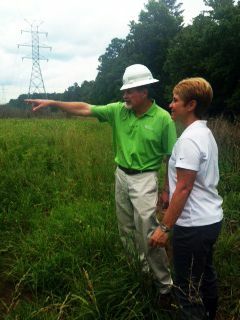 Jeff Racey of Duke Energy and Becky Langer of Bayer inspect the site in Durham, N.C. 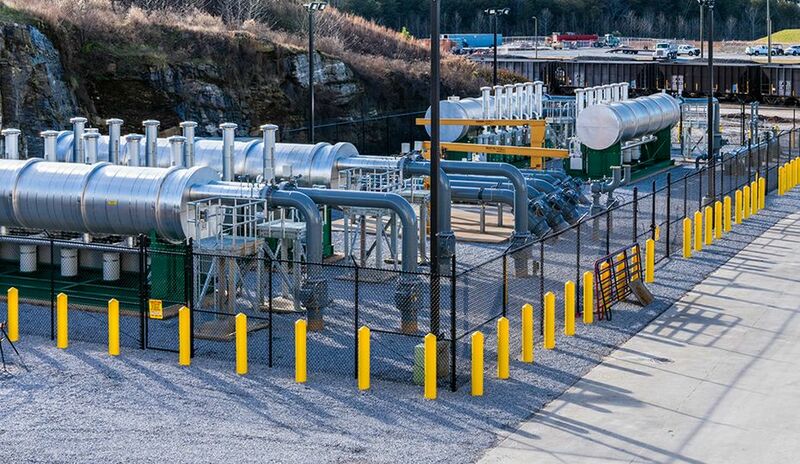 The outcome benefits customers by reducing the likelihood of damage to power lines and is environmentally friendly, said Korey Meadows, another Duke Energy forester. Energy companies’ federal mandate to keep power lines clear from vegetation can sometimes lead to strained relations with customers. Residents of a Clearwater, Fla., neighborhood were upset in 2015 when Duke Energy workers removed tall-growing shrubs and trimmed trees away from power lines near their homes. Some thought the workers cleared too much. 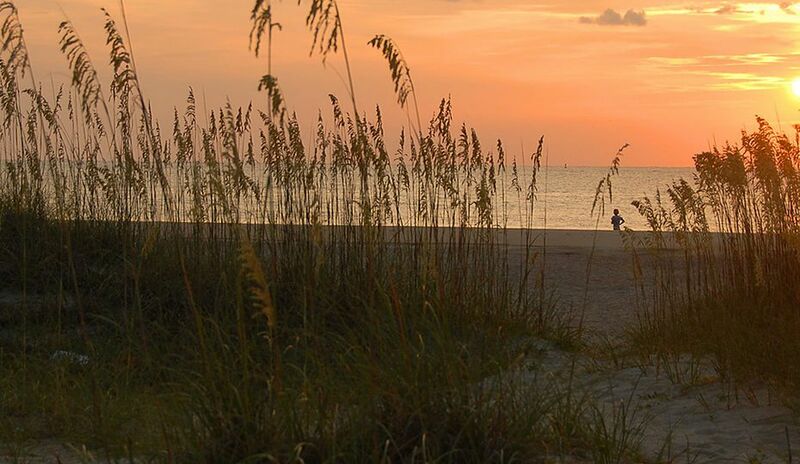 In response, Duke Energy partnered with Pinellas County to replant small trees, shrubs and flowers, which have sprouted into an attractive landscape for butterflies and bees. 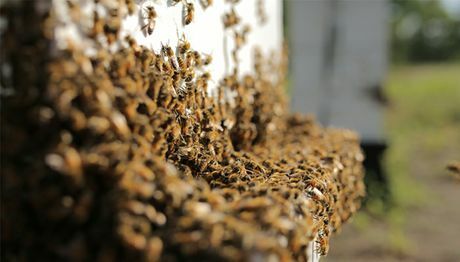 Beekeepers say Duke Energy, which maintains thousands of miles of rights of way in the Carolinas, Florida and the Midwest, has a unique opportunity. 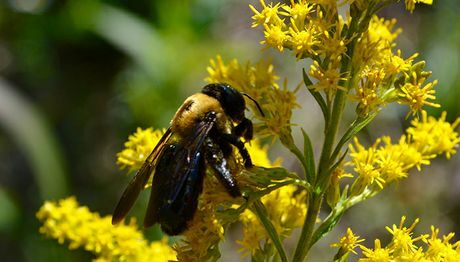 Duke Energy’s pollinator project with Bayer and IVM Partners, a company that specializes in vegetation management and conservation, offers test cases to study. Using selective herbicides, workers last year cleared woody plants from two utility rights of way, in Greensboro and Durham, N.C.
Racey and Becky Langer, of Bayer’s Crop Science Division, recently visited the Durham site and were encouraged by what they saw. “Blooming milkweed, butterflies, bees – we did see lots of pollinators,” Langer said. Bayer is on a quest to plant 50 million flowers as part of its “Feed a Bee” program. The company will plant 200 seeds each time someone watches its two-minute Feed a Bee video and shares it. Watch the Feed a Bee video, then share on social media and Bayer will plant 200 seeds. Or go to feedabee.com to find out more information and get free seeds. More information about bees: www.beecare.bayer.com/home. 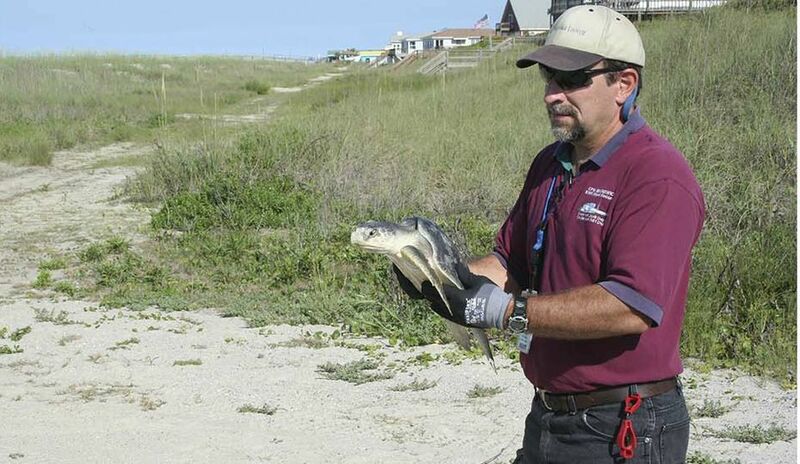 More information about Duke Energy’s vegetation management program.